So, I haven’t been updating the garden blog for oh-too-long. This year in particular has been crazy with all-things-pregnancy and the expected arrival (who, by the way, was due four days ago!) To be honest, it doesn’t seem quite fair to post for this year’s harvest anyway…. Christi’s been the green thumb this year. Other than the initial planting decisions, I’ve made maybe half a dozen appearances outside this summer. It’s just been way too hot for this gal. Anyway, today is the first day in what seems like months that our weather has been sunny AND below 80 degrees outside. It’s just gorgeous. So I helped out for about an hour with pruning back the roses, the mint, and some other random things. I wanted to share this picture. 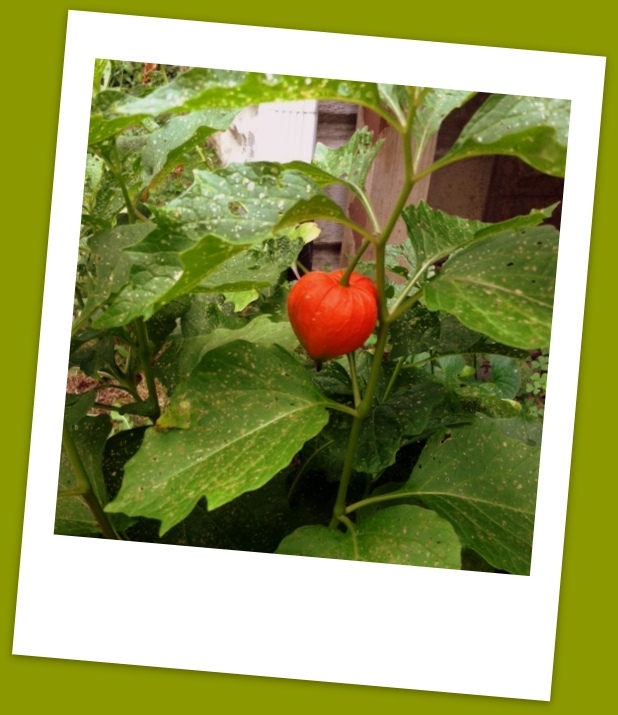 It’s a chinese lantern plant. We bought it in a small pot from Lowe’s or some place similar in 2008…when we moved to Columbus. Directions on the pot said it was to be treated as an annual, but I know these things spread and they can come back with a vengeance. The pot was left out on our back porch over half the winter before Christi finally hid it in the garage. (I just did not have the heart to toss out a plant who was still hanging on to one last lonely lantern.) The following Spring…the same plant started making an appearance directly below the back porch. We’ve left it there for 3 years waiting and hoping, going back and forth several times on whether or not this was some mean ol’ mimicky weed just teasing us. And then about a week or two ago…this li’l guy showed up green as could be!! In the last week, he’s gone from green to bright ORANGE!! I’m so excited and can’t believe it took so long to finally grow a lantern of my own.